Melbourne's Copia are today lobbing a clusterbomb of amazing news and announcements in the direction of fans - a brand new single, the announcement of their album release date and a tour to celebrate. 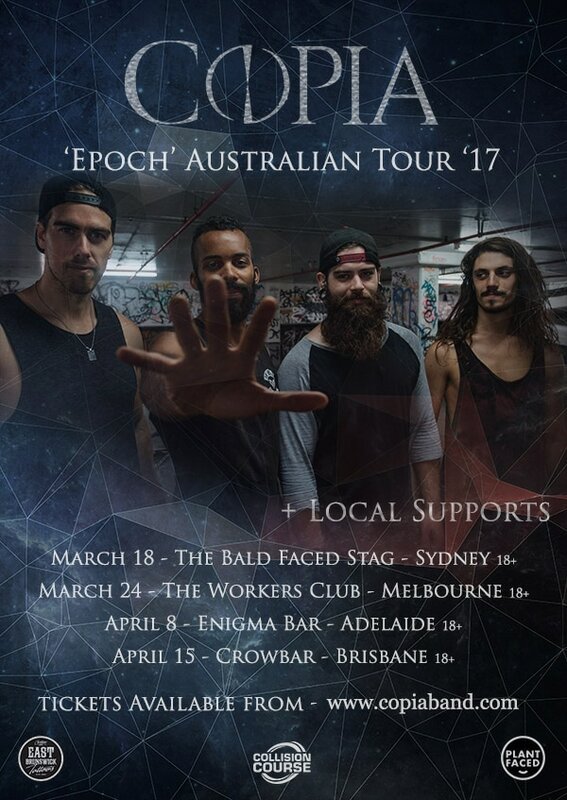 Friday 31st March will see the release of second full-length album Epoch and today is the first listen to second cut from the record, Never Forget and they are today announcing their Australian dates to celebrate the Epoch album release. iTunes pre-orders go live this Friday 17th February, with punters getting new single Never Forget straight away. Epoch was recorded with Chris Blancato (Northlane, DVSR) and produced/mixed with Will Putney (Northlane, Every Time I Die, Misery Signals, Knocked Loose, The Amity Affliction). March and April see Copia hitting Sydney, Melbourne, Adelaide and Brisbane in a fiery run of dates at The Bald Faced Stag (Sydney), The Workers Club (Melbourne), Enigma Bar (Adelaide) and Crowbar (Brisbane). On the topic of what the album is about, vocalist Andrew Bishop vehemently states, "We’re fed up with the current state of the world & we’re commenting on that throughout the album. This is our Epoch. Our music has become heavier as our lyrical themes have gotten darker & this album states that we refuse to sit back & continue to watch the world fall apart around us. When people are listening to this album, we want them to question why our species is so filled with hate, why it is so destructive, why it worships false idols & why it is so disconnected & money obsessed. We wrote this album because we feel a responsibility to share these messages & wake people up to what is in fact reality. Thanks to the help of Chris Blancato [Engineer - Northlane] & Will Putney [Mix & Master - The Amity Affliction, Northlane, Thy Art Is Murder, Breakdown of Sanity] we're stoked with the end result & could not be more ready to release & tour the album." Sharing the stage with the likes of Northlane in Russia and booking their own headline tours across Germany, it wasn’t long before Eleven:Eleven became a word of mouth hit all over Europe with fans travelling from Belgium, Netherlands and Austria to tip their hats in the direction of the Copia lads. Arriving back in Australia and headlining a tour down the East Coast as well as playing alongside Dream On, Dreamer saw Copia develop a charismatic reputation on and off the stage through a combination of artistic finesse and unique business minded approaches. Previous single Hostility was playlisted on triple j's The Racket by Lochlan Watt, aiding Copia in selling in excess of 27,000 hard copies of Eleven:Eleven, accumulate 70,000 plays via streaming services, exceed 10,000 plays on Bandcamp and 400,000 combined listens on YouTube.